The Canadian Respiratory Health Professionals (CRHP) is the multi-disciplinary healthcare professional assembly of the Canadian Thoracic Society (CTS). 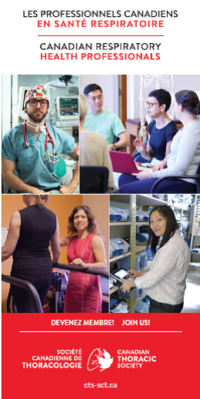 CRHP welcomes nurses, respiratory therapists, cardio-pulmonary physiotherapists, pharmacists, and other health professionals working in the respiratory field as well as students. CRHP members of CTS enjoy excellent benefits! CRHP holds its Annual General Meeting in conjunction with the Canadian Respiratory Conference.